Be a part of effective integration by attending our Café Lingua in Brussels. Meet people from all over the world together with those from just around the corner and enjoy the community atmosphere. Native language tutors will support you with fun games and materials in French, Dutch, English, Turkish, Arabic and Farsi. Get communicating at Café Lingua! Welcome Home International is a non-profit organisation developing effective and respectful methods for refugee and immigrant integration. How do we do that? Our first steps toward achieving this is better communication. As a product of the Language Voices project, Welcome Home International will launch its Women’s Circle meeting group on a small scale in May 2018. This will be a women’s only language café held during a midweek morning. Alongside we will operate our volunteer run Kid’s Corner with a child language and homework support. Cafe Lingua in Helsinki is an international, multilingual event where people come to practice speaking in different languages, organised in a cafe/bar in central Helsinki. It has been running for over a decade. Different languages are spoken in different tables, both native and non-native speakers present, and you can change tables when you want. There is usually free discussion, socialising, playing board games and other material. Finnish and Swedish tables have tutors with the funding from Finnish Culture Foundation and Swedish Culture Foundation (picture and discussion cards, Q&A, exercise sheets). The event takes place every week, there are approx. 70-90 participants every week, and more than 10 languages spoken. The event is organised in cooperation with several organisations and is free for all to attend. 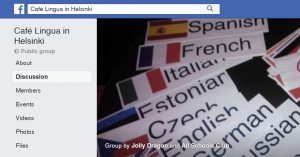 The event is mainly coordinated and advertised via its Facebook group “Cafe Lingua in Helsinki”. Language Cafe Sorrento is an international, multilingual event where people are able to practice speaking in different languages. It is based at Sant’Anna Institute, in via Marina Grande 16. Sant’Anna Institute organizes study abroad programs for US University students, Italian language courses for foreigners and foreign language classes for local people. The first meeting of our Language Cafè has been organized in March 2018. Different languages are spoken in different tables, both native and non-native speakers join and you can change tables when you want. The events include free discussion, socialising, playing board games and other material. And, of course, coffee and cakes! Teachers and advanced students at Sant’Anna help us as tutors. The event takes place every other Thursday, 6-8 pm. There are approx. 15 participants every meeting with 3 or 4 tables/languages. 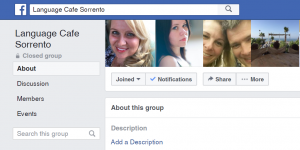 The event is mainly advertised via its Facebook group “Language Cafe Sorrento”. Participation is free and available for everyone! 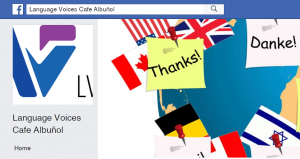 Our “language cafe” at Albuñol, café of languages in Spanish, takes place every Tuesday morning in Albuñol, organized at the bar “Casa Pepe”. It is an event where people can practice English and Spanish, in an informal way, with native speakers. In the future the number of languages will be increased. It is done in different tables, each table is a language to practice and participants can change tables whenever they wish. The material used ranges from flashcards with photos to introduce a debate, discussions or different points of view, traditions and parties to board games, cards, memory games, real objects, etc. The tutors are responsible for a good atmosphere, dynamics and fun. Of course, there is no lack of coffee and cakes! Participation is free and available to anyone who wants to learn and practice English and Spanish. You learn and have fun at the same time. The event is announced with posters and it is mainly advertised on facebook ceper cehel de Albuñol. 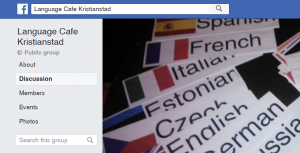 Our Language café Kristianstad is located at Folkuniversitetet in Kristianstad, Sweden, and started in December 2017. We have volunteers from Chripu (Kristianstad’s Senior University) and from Rotary in Kristianstad. Volunteers have different backgrounds such as language teachers, nurses, supervisors etc and they are facilitators in the café. We meet on Tuesdays between 13.30-15.30, we go through what we will discuss and split in to smaller groups with different topics. The material we use is from beginner to advance depending on the participant’s language skills. We use flash cards, memory, pictures and texts to start the conversation. Often they want to discuss topics like “How do I search for a job?” and “What should I think of an interview?” They also want to know about unwritten rules in Sweden, and similarities / differences between our cultures and customs. Around 14-20 people are participating in the Café and we think this number is good, because then we can get 4-5 groups with different subjects and level and everyone has a chance to talk. We have planned that the language café will continue in the future and have hopes that the number of participants and volunteers will increase. The goal is to expand with several languages. In our language cafes there is good atmosphere and lots of fun, and we always have a good cup of coffee and cake. 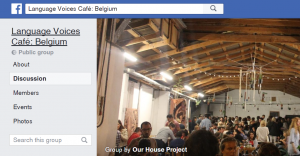 Language Café Maastricht is a new multilingual language café, taking place on a weekly basis from May 2018. The café is on Tuesdays from 18.00-20.00 at Brasserie Tapijn, surrounded by university buildings and upcoming creative spaces, and offers the opportunity to practise Dutch and other languages in an informal setting. Due to the city’s geographic location and international character, we are aspiring to offer as many languages as possible, and to attract Maastricht’s broad international community. We provide flashcards, games and other material for it to be a fun and engaging activity for all participants. We are looking for tutors and volunteers to grow with us, so if you are a native or proficient speaker willing to share your language with others, get in touch via facebook “LCM – Language Café Maastricht” or lcmaastricht@gmail.com. The café is organised by Katja Primozic on behalf of Stichting Vrouw en Welzijn. Katja recently returned back to Maastricht after living and studying in the UK, where she worked at a language school for many years, and is looking forward to bringing together people from all over the world in her hometown! Language Cafe Bursa is an event that takes place under the Language Voices in EU project. Language Cafe Bursa is organized every week on Mondays at Sanat-Mahal Café. It continues regularly with an average of 50 participants. It intends to make language learning easier and accessible by having fun with providing language learning materials in English, French, Arabic and Spanish. Tutors for each language are taking charge of the organization and support language development of the participants in different tables. Tutors whose native languages are French and Spanish are encouraging participants to learn by speaking in the context of informal education. In addition to being informal, educational materials are prepared by project partners in different languages such as Finnish, English, French, Dutch, Italian, Spanish, Arabic and Turkish. Language cards, games, illustrated alphabet cards, discussion cards are just few materials that we have been using in our language cafes. Participation is free and available for everyone. You can find more details on Language Cafe Bursa Facebook group or Bursa Education and Youth Association page. You can easily tell us which language you want to learn by filling in our questionnaire. You can also find news from other Language cafes.